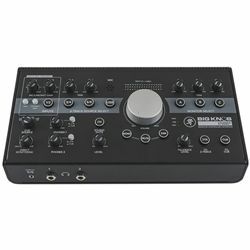 Sure, we all know the Mackie Big Knob is the go-to monitor controller for studios the world over. But, now that we've added in the high-resolution goodness of an Onyx recording and playback solution, Big Knob truly becomes the nerve center for your studio. Or, if you are looking for excruciatingly simple volume control/monitor switching, the Big Knob Passive delivers at an amazing price.